This retelling of Snow White is set in New York City in 1928. Snow is the daughter of a successful Wall Street tycoon who becomes enthralled by the Queen of the Follies - the evil stepmother. Snow's father dies suddenly and her stepmother receives a message from the stock ticker that Snow is more beautiful. 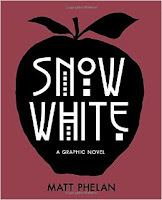 When Snow escapes from the hunter sent to kill her, she is taken in and protected by seven street urchins until she is brought down by the poisoned apple. While the setting is intriguing and Phelan does a good job using the trappings of that time period to tell the parts of the original story, I was not impressed overall. I think most teens will be out of touch with the era - the stock ticker, the Follies, Hoovervilles, and more. Also, Phelan's pictures just don't grab me in any of his books, not just this one. Not my cup of tea/bathtub full of gin.